Author of an Arabic version of the "Yosippon"; flourished in the tenth or eleventh century. His version exists in three recensions: (1) in several manuscripts which yet await thorough examination; (2) an abbreviated text printed in the Paris and London polyglots (1645, 1657) as II Maccabees ("Kitab al-Maḳabiyyin"), the term "Maccabees" here connoting the entire Hasmonean dynasty, since the book begins with the death of Alexander the Great and ends with the destruction of Jerusalem by Titus; and (3) an abstract printed under the title "Ta'rikh Yosippus al-Yahudi" (Beirut, 1873). According to a manuscript at Leyden (No. 1982), Ibn Ḥazm (d. 1063) was acquainted with the Arabic translation from the Hebrew. From an investigation of the Arabic version as contained in two Parisian manuscripts (No. 1906; De Slane, No. 287), Wellhausen has reached the conclusion ("Der Arabische Josippus," in "Abhandlungen der Königlichen Gesellschaft der Wissenschaften zu Göttingen," new series, i. 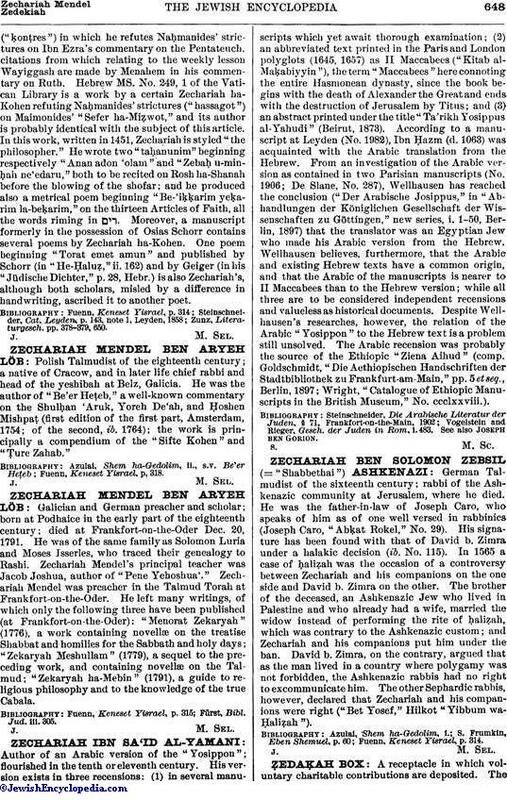 1-50, Berlin, 1897) that the translator was an Egyptian Jew who made his Arabic version from the Hebrew. Wellhausen believes, furthermore, that the Arabic and existing Hebrew texts have a common origin, and that the Arabic of the manuscripts is nearer to II Maccabees than to the Hebrew version; while all three are to be considered independent recensions and valueless as historical documents. Despite Wellhausen's researches, however, the relation of the Arabic "Yosippon" to the Hebrew text is a problem still unsolved. The Arabic recension was probably the source of the Ethiopic "Ziena Aihud" (comp. Goldschmidt, "Die Aethiopischen Handschriften der Stadtbibliothek zu Frankfurt-am-Main," pp. 5 et seq., Berlin, 1897; Wright, "Catalogue of Ethiopic Manuscripts in the British Museum," No. ccclxxviii.). Vogelstein and Rieger, Gesch. der Juden in Rom, i. 483. See also Joseph ben Gorion.